Yesterday was an amazing day for me on many levels, but the most unique part of the day was when expert balloonist Dahlia “Sweet” Jayaram dropped by my new house for a look-see. Dahlia is very familiar with the entire New England region including the period when Nantucket sank into oblivion (check her comments in earlier blog post). We slowly rose over my plot and before I could get my camera focused we were on our way. First stop was to be the town at Marblehead. I had immediately lost all sense of direction, but I think we were headed northerly. That’s Dahlia (I think Dahlia lives in Costa Rica… I’ll have to ask) in her tropical attire and me shivering in my sweater. hehe. Is that not a spectacular view or what? 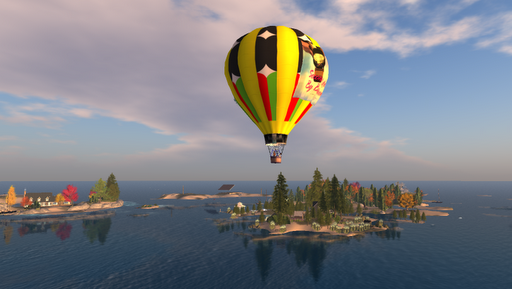 For those who don’t already know, Dahlia has flown her balloon across all of the Second Life continents on the grid. She has also written ebooks about each continent and has like an encyclopedic knowledge of the Grid. Our first stop on the journey was at the port at Marblehead. With the same precision she showed the day she landed in my Zen garden, she effortlessly landed in the shopping center. We travelled across many lovely islands and then approached our destination, Sudane’s sim. We actually approached from the other side where I shot some pics of Sudane’s estuary (I’ll include in next Flickr upload). The thing that I loved most as we approached is the long sand bar extending off Sudane’s home. Here’s where we landed, right out on the tip of the sandbar at Land’s End. We sat here soaking up the beauty for I don’t know how long. This wasn’t the end of our adventure, Dahlia took me home across one more amazing sky passageway, but this place truly immersed me in the special feel of this region. I don’t think you have to be a gung ho explorer to appreciate a large sim group like New England. And I’ve been thinking a lot about large sim groups lately; I mean, knowing that there’s more just over the next sim is a wonderful feeling. And here there is a network of sims beautifully terraformed and landscaped, and there is that southerly passage all the way to the heart of the Blake Sea. This is what it takes to truly be a Wonder of Second Life. Thank you Dahlia for a wonderful adventure. I'm an avatar in Second Life where I star as the heroine of a virtual fantasy life. In the real world, I'm writing my debut sci-fi novel. This entry was posted in Exploring and tagged Adventure, Beautiful Regions, Community, Exploring, Photography, Second Life. Bookmark the permalink. wow what a hreat day. yeah, i was really honored that Dahlia was willing to show me around. She's an amazing lady and really knows her way around.